Eugene "Killer" Edgerson of the Harlem Globetrotters goes up for a layup. The Harlem Globetrotters are an exhibition basketball team that combines athleticism and comedy to create one of the best-known sports entertainment franchises in the world. Over the years, they have played more than 20,000 exhibition games in 118 countries. Created by Abe Saperstein in 1927 in Chicago, Illinois, the Globetrotters were originally a serious competitive team, beating the premier professional team, the Minneapolis Lakers (led by George Mikan), for two years in a row in 1948 and 1949. In the 1950s, the Globetrotters added comic routines, involving amazing coordination, skillful passing and dribbling, balancing or spinning balls on their fingertips, and trick shots, until they became known more for entertainment than sports. Their warm-up routine, done to the tune of Brother Bones' whistled version of "Sweet Georgia Brown," became their hallmark. Known as the "Clown Princes of Basketball," the Globeterotters drew large family crowds who marveled at the antics of "Meadowlark" Lemon, Jerome James, Reece "Goose" Tatum, and Fred "Curly" Neal. Future NBA greats like Wilt "The Stilt" Chamberlain and Connie "The Hawk" Hawkins, also played with the team. During the 1970s and 1980s, in addition to their world touring, the Globetrotters were featured in numerous television series and specials, including appearances in live-action variety shows and several Hanna-Barbera cartoons. In 2002, the team was inducted into the Basketball Hall of Fame. Globetrotters player Meadowlark Lemon presenting a ball signed by the team to First Lady Betty Ford in 1974. The Globetrotters emerged from the South Side of Chicago in the 1920s, where all the original players grew up. Most, if not all of these players attended Wendell Phillips High School. Several of the players were members of the Savoy Big Five, a team that played exhibitions before dances when the Savoy Ballroom opened in November 1927. In 1928, several players left the team in a dispute over bringing back other players who quit the team earlier. That fall, player Tommy Brookins formed the "Globe Trotters," which toured southern Illinois throughout the winter. Exactly how Abe Saperstein became involved with the team is unclear. However, by 1929 Saperstein was the team's manager and promoter, touring Illinois and Iowa with the "New York Harlem Globe Trotters." Saperstein picked Harlem as the team's "home" city since Harlem was considered the center of African-American culture at the time, and an out of town team name would give the team more of a mystique. After four decades of existence, the Globetrotters finally played their first "home" game in Harlem in 1968. Although the Globetrotters were originally a serious competitive team, today they are primarily a family entertainment attraction, featuring dazzling displays of dibbling, juggling, trick shots, comic skits involving referees and opposing players, and various other antics. The first star player of the early Globe Trotters (the name would later be merged into one word) was Albert "Runt" Pullins, an adept dribbler and shooter. Soon he would be joined by six-foot, four-inch Inman Jackson, who played center and had a flair for showboating. They would originate the key roles that would stay with the team for decades. The Globetrotters were initially a serious competitive team, and despite a flair for entertainment, they would only clown for the audience after establishing a safe lead in the game. In 1937, they accepted an invitation to participate in the World Professional Basketball Tournament, where they met the New York Rens in the semi-finals in the first big clash of the two greatest, all-black professional basketball teams. The Rens defeated the Globetrotters and went on to win the tournament. However, in 1940, the Globetrotters avenged their loss by defeating the Rens in the quarterfinals and advancing to the championship game, where they beat the Chicago Bruins in overtime by a score of 37-36. The Globetrotters also beat the premier professional team, the Minneapolis Lakers (led by George Mikan), for two years in a row in 1948 and 1949, with the Lakers winning later contests. The February 1948 win (by a score of 61-59, on a buzzer-beater) was a hallmark in professional basketball history, as the all-black Globetrotters proved they were on an equal footing with the all-white Lakers. Momentum for ending the NBA's color line grew, and in 1950, Chuck Cooper became the first black player drafted by an NBA team. From that time on, the Globetrotters had increasing difficulty attracting and retaining top talent. Tony Peyton was the last living member of the original Globetrotters. He was inducted into the Basketball Hall of Fame in Springfield, Massachusetts, in 1996. He died in Midland, Texas, on July 23, 2007, at the age of 85. Wilt Chamberlain in his Globetrotter days. The Globetrotters gradually worked comic routines into their act until they became known more for entertainment than sports. Their acts often featured incredible coordination and skillful handling of one or more basketballs, such as passing or juggling balls between players, balancing or spinning balls on their fingertips, and making various kinds of trick shots. Their choreographed warm up routine, to the tune of Brother Bones' whistled version of "Sweet Georgia Brown," became the team's signature. Among the well-known players who have been Globetrotters are NBA (National Basketball Association) greats Wilt "The Stilt" Chamberlain, Connie "The Hawk" Hawkins, and Nat "Sweetwater" Clifton, as well as Marques Haynes, George "Meadowlark" Lemon, Jerome James, former Temple coach John Chaney, and Reece "Goose" Tatum. Another popular team member in the 1970s and 1980s was Fred "Curly" Neal, who was the best dribbler of that era of the team's history and was immediately recognizable due to his then-unusual shaven head. Baseball Hall of Famers Bob Gibson, Ferguson Jenkins, and Lou Brock also played for the team at one time or another. In 1985, the Globetrotters signed their first female player, Olympic gold medalist Lynette Woodard, and their second, Joyce Walker, just three weeks later. Because virtually all of its players have been African-American, and because of the buffoonery involved in many of the Globetrotters' skits, they drew some criticism in the Civil Rights era. The players were derisively accused of "Tomming for Abe," a reference to Uncle Tom and white owner Abe Saperstein. However, prominent civil rights' activist Jesse Jackson came to their defense by stating, "I think they've been a positive influence... They did not show blacks as stupid. On the contrary, they were shown as superior." 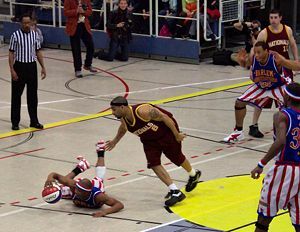 A Globetrotter puts on a dribbling exhibition against a member of the New York Nationals. After losing to the Washington Generals in 1962, the Harlem Globetrotters only lost two more games in the next 38 years (12,596 games). Usually they played a "stooge" team owned by Red Klotz, which also appeared as the Boston Shamrocks, New Jersey Reds, Baltimore Rockets, or the Atlantic City Seagulls. On January 5, 1971, they lost in Martin, Tennessee in overtime to the New Jersey Reds; the 100-99 score ended a 2,495 game winning streak. 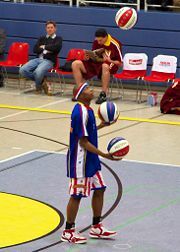 In addition to their hundreds of exhibition games, the Globetrotters have faced some competitive action since the mid-1990s. On September 12, 1995, they lost 91-85 to Kareem Abdul-Jabbar's All Star Team in Vienna, Austria, ending a run of 8,829 straight victories going back to 1971. The 48-year-old Abdul-Jabbar scored 34 points. The Globetrotters won the other 10 games during that European tour. They immediately went on another winning streak of 1,270 games before losing 72-68 to the Michigan State University Spartans on November 13, 2000. On February 27, 2006, the Globetrotters extended their overall record to exactly 22,000 wins. Their most recent loss came on March 31, 2006 when they went down 87-83 to the NABC College All-Stars to bring their loss tally to just 345—still a winning percentage of 98.5 percent. The Globetrotters claim all their exhibition games are "real, competitive" contests. During the 1970s and 1980s, the team was controlled by Metromedia and, in addition to their touring and playing the Washington Generals or the New York Nationals, they were featured in numerous television series and specials, including appearances in live-action variety shows and several Hanna-Barbera cartoons. After a period of decline, the Globetrotters franchise was purchased by former team member Mannie Jackson in 1993, and its fortune revived again. In 2002, the team was inducted into the Basketball Hall of Fame. To offset the criticism that they do not play "real basketball," in recent years the Trotters have scheduled games against college teams and pickup teams like Magic Johnson's All Stars with varying results. This renews a tradition of playing NBA teams, which the Globetrotters did during the 1950s. The Globetrotters visited Pope John Paul II at the Vatican in November 2000, and named the Pontiff an Honorary Harlem Globetrotter. More recently, the Globetrotters visited troops in Iraq where they played in a series of matches on local courts. Today's Globetrotters are based in Phoenix, Arizona. The Harlem Globetrotters, 1951 feature film starring Whitney Rumsey and other Globetrotters, also featuring Thomas Gomez, Dorothy Dandridge, Bill Walker, and Angela Clarke. Featured players included Tatum, Haynes, Babe Presley, Ermer Robinson, Duke Cumberland, Clarence Wilson, Pop Gates, Frank Washington, Ted Strong, and others. Also featured is a lot of actual game footage—three times against the Boston Celtics—including their famous "Sweet Georgia Brown" warm-up routine. Go, Man, Go, a 1954 sequel, starring Dane Clark as Abe Saperstein and Sidney Poitier as Inman Jackson. Harlem Globetrotters, a Hanna-Barbera Saturday morning cartoon, broadcast from September 12, 1970 to May 1973. Originally broadcast on CBS, and later re-run on NBC as The Go-Go Globetrotters. The Super Globetrotters, a second animated series created by Hanna-Barbera for NBC in 1979. Harlem Globetrotters: The Team that Changed the World, a 2005 documentary featuring interviews with the Globetrotters, NBA coaches, and fans such as Bill Cosby, Samuel L. Jackson, Phil Jackson, and Henry Kissinger. Hardwood. Former Globetrotter Mel Davis was the subject of this short documentary. It was directed by his son, Hubert Davis. This film was nominated for an Academy Award for Documentary Short Subject in 2006. Interview with Billy Ray Hobley www.famousinterview.ca. This page was last modified on 1 August 2017, at 22:10.